Play dough is a staple amongst ECE educators. 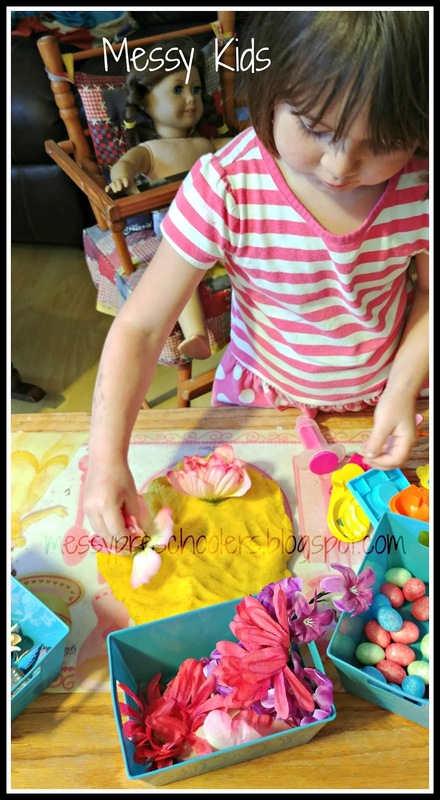 It's a great tool for imaginary play, exploration, and helps to build-up the fine motor skills needed for writing. It's also cheap to make. I often use this no cook recipe from The Imagination Tree. It's what I used in the picture below. 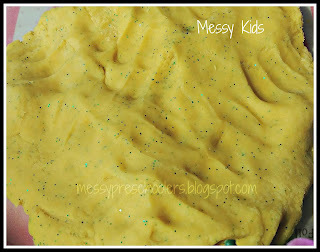 I added yellow food coloring and green glitter to make it "springy." The dollar store is a handy resource for cheap exploratory supplies. If you are like me, and don't go often, Amazon is fantastic too (not to mention it'll be delivered right to your doorstep). When I go to the dollar store, it takes me forever because I'm hunting for anything I can use for art and sensory activities. It's amazing what you can find, especially amongst the seasonal items. And the containers! 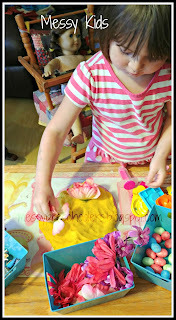 So many cute ways to present invitations to play/explore as well as for storing said objects. For this particular invite, I set out the homemade play dough, sparkly Mini Styrofoam Eggs , silk flowers, and plastic butterflies . The other play dough tools are all on a low shelf for easy access. 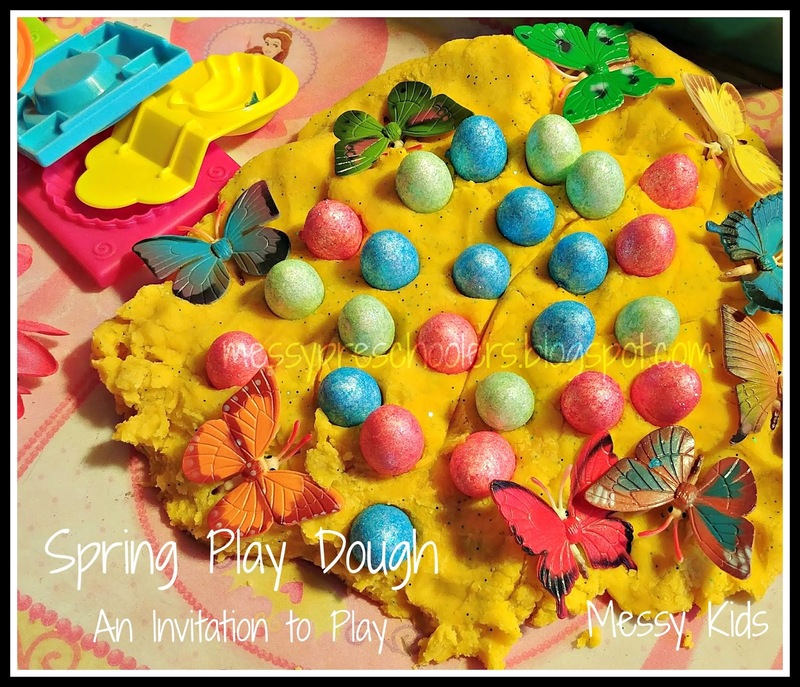 This particular spring themed invitation allows a child to explore concepts of spring: plants/gardening, new life, insects (life cycle), and Easter (if one chooses). 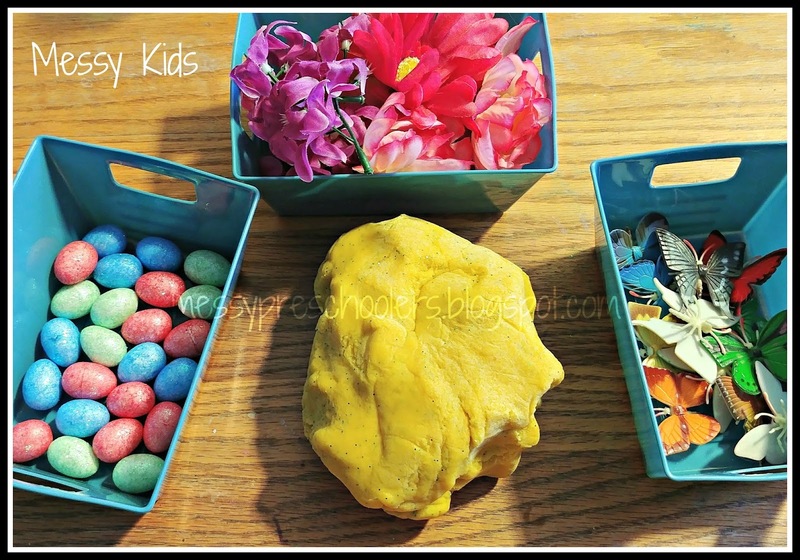 This activity allows for independent play and free exploration of materials. You may be asking, "what is an invitation to play?" and that would be a great question. 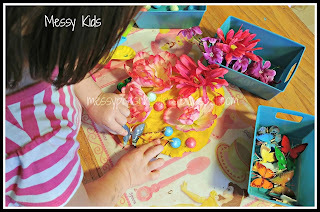 For an awesome tutorial, check out Creating the Invitation to Play on Teach Preschool and Creating Invitations to Play! on The Imagination Tree. Good blog. Lots of great information and inspiration, both of which we all need. Thanks. 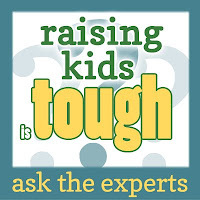 Really it is one of the best blogs about Home learning educational toys. This blog have contained very useful info about toys which is important for all the people which are looking for educational toys.